As we enter the twenty-first century, the marketing function remains concerned with serving customers and consumers effectively. The authors propose that just as the marketing function gradually shifted from mass marketing to segmented marketing in the twentieth century, it will increasingly move toward customer-centric marketing in the next century. In the practice of customer-centric marketing, the marketing function seeks to fulfill the needs and wants of each individual customer. The antecedents of customer-centric marketing are the increasing pressure on firms to improve marketing productivity, increasing market diversity in household and business markets, and technology applicability. On the basis of the shift toward customer-centric marketing, the authors expect increased importance of marketing as a “supply management” function, customer outsourcing, cocreation marketing, fixed-cost marketing, and customer-centric organizations. This article highlights the implications of customer-centric marketing as well as the boundary conditions that will affect its adoption. The marketing function has undergone dramatic shifts in the past 50 years. Mass marketing came into vogue in the United States after World War II. Firms had access to mass production technology, better transportation and communication facilities, greater financial resources, and more sophisticated human resources management (cf. Carson 1967; Mallen 1975). Customers had many unmet needs and were satisfied with standardized products at reasonable prices. Competition intensified as regional and local marketers became fully integrated into a unified market system. After the shortages of World War II, mass production coupled with mass distribution and communication created a mass consumption society, and the focus of marketing activities was on promoting, pricing, and distributing products for the mass market. The emphasis was on products rather than on markets, leading companies to adopt organizational forms centered on products (cf. Sloan 1963). As more firms entered the market, the resulting increase in product variety rendered mass-market techniques less effective. Gradually, firms started paying more attention to markets rather than products (Figure 1). This shift in the marketing discipline occurred primarily in the 1950s when the marketing concept was first recognized. McKitterick (1957), Borch (1957), and Keith (1960) articulated the tenets of the marketing concept that were popularized by Kotler (1967) and soon widely adopted. With an increasing emphasis on markets, segmentation was a logical destination. The earliest references to segmentation were from Smith (1956), who suggested a rational and more precise adjustment of products and marketing efforts to consumer or user requirements through segmentation. There was an explicit recognition of several demand schedules, whereas only one was recognized before. The shift from a product orientation to the marketing concept led to many changes in marketing thought and practice. 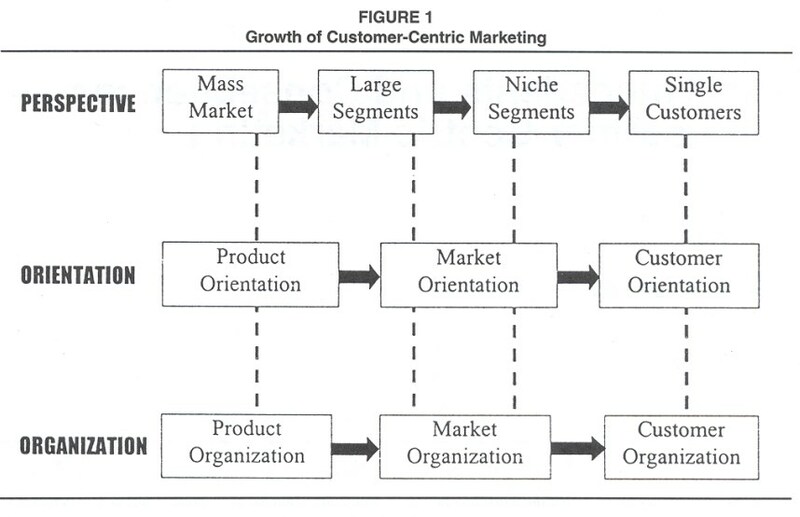 In the organizational context, marketing-thought leaders developed the concept of market orientation (Kohli and Jaworski 1990; Narver and Slater 1990). They suggested that organizations should focus on the markets that they serve. In practice, firms organized around markets and segments, that is, created segment-based organizations. For example, AT&T divided its marketing department into groups dedicated to household and business markets with subsequent subdivisions within each market, while IBM organized itself into vertical industry-based groups. With increased competition, marketers started defining smaller and smaller segments, including niche segments. The manifestation of this phenomenon was a proliferation of brands and channels. As we enter the new millennium, we propose that the confluence of demographic and technological factors as well as dissatisfaction with existing marketing productivity will lead to the widespread adoption of customer-centric marketing in place of product and segment-centric marketing as a way to effectively and efficiently serve customers and consumers in the twenty-first century. Marketers must understand the factors driving the growth of customer-centric marketing as well as the consequences of customer-centric marketing, since the essence of marketing is to anticipate the behavior of customers and competitors. Such “anticipatory management” can give organizations a competitive advantage (Ashley and Morrison 1997). Trends that are anticipated can be planned for, and competitive advantage accrues to firms that do so better and earlier than their competitors. Companies that adopt customer-centric marketing earlier and more aggressively than their competition are likely to enjoy a sustainable advantage. The purpose of this article is to examine the antecedents, consequences, and boundary conditions associated with customer-centric marketing. The next section discusses the meaning of customer-centric marketing and why it should be regarded as the natural progression of marketing practice. Subsequent sections discuss the antecedents, consequences, and boundary conditions of customer-centric marketing. The final section discusses the implications of customer-centric orientation for the marketing function. Customer-centric marketing emphasizes understanding and satisfying the needs, wants, and resources of individual consumers and customers rather than those of mass markets or market segments. In customer-centric marketing, marketers assess each customer individually and make a determination of whether to serve that customer directly or via a third party. Also, customer-centric marketers determine whether to create an offering that customizes the product and/or some other element(s) of the marketing mix or standardize the offering. Their actions are guided by analysis that seeks to maximize the “effective efficiency” of marketing actions (Sheth and Sisodia 1995). Efficiency entails cost-benefit analysis and seeks to maximize the output-to-input ratio of the marketing function for individual customers. Effectiveness entails the enhancement of customer loyalty and “share of wallet.” The objective of customer-centric marketing is to maximize both efficiency and effectiveness simultaneously at a customer level. Customer-centric marketing is distinct from one-to-one as well as relationship marketing. Several authors have recently suggested that firms practice one-to-one marketing through the use of mass customization (Gilmore and Pine 1997; Peppers and Rogers 1993; Peppers, Rogers, and Dorf 1999; Pine, Victor, and Boynton 1993). One-to- one marketing focuses on the adaptation of product or offering, that is, product-centric approach, and makes the product the starting point of planning process. In contrast, customer-centric marketing focuses on the needs, wants, and resources of customers as the starting point of the planning process. It is important to draw a clear distinction between customer-centric marketing and relationship marketing. For the practice of effective relationship marketing, a customer-centric focus will need to emerge. The converse is generally not true as customer-centric marketing may be practiced without relationship marketing. Transactional customer-centric marketing occurs often in direct marketing situations wherein the level of customer involvement and interest in an interactive relationship is low. Also, as we will discuss later, customer-centric marketing may lead to the outsourcing of customers. In Figure 2, we present a framework that explicates the antecedents, consequences, and boundary conditions of customer-centric marketing. We propose that there are three underlying reasons for the growth of customer-centric marketing. The first reason is that concerns about the efficiency and effectiveness of marketing activities are high among senior management. Customer-centric marketing enhances productivity by focusing on profitable customers and reducing the subsidization of unprofitable customers. Second, market diversity in both business and household markets is increasing the variance in the needs and wants of markets. Finally, powerful and affordable new technologies allow marketers to better meet the needs of individual customers. The growth of customer-centric marketing will lead to nonintuitive consequences. First, whereas traditional marketing has been concerned with demand management, customer-centric marketing will lead the marketing function toward supply management. Second, traditional marketing practices emphasize the acquisition of customers, while in contrast, customer-centric marketing will lead firms toward outsourcing a subset of customers. Third, whereas traditional firms and customers are institutionally separate with little interaction, customer-centric marketing will lead to customers and firms cocreating products, pricing, and distribution. Fourth, customer-centric marketing costs will be more fixed costs and less variable costs. Finally, the vocabulary, metrics, and organizations will evolve toward a customer focus rather than a product focus or segment focus. For example, Procter & Gamble renamed its channel sales organization as “customer business development” in early 1999. The following sections discuss these aspects in depth and develop research propositions. Senior management’s long-standing concerns regarding marketing productivity are reflected in Webster’s (1980) research on CEOs’ views of the marketing function. CEOs were concerned about the diminishing productivity of marketing expenditures, had a poor understanding of the financial implications of marketing actions, and observed a lack of innovation and entrepreneurial thinking. Twenty years later, these concerns are still paramount for marketers. Nonmarketing functions have achieved substantial productivity improvements in the last few decades. For example, manufacturing and operations have become substantially more efficient and effective through six sigma, zero-defect processes, automation, the use of just-in-time approaches, product redesign for assembly and manufacture, and flexible manufacturing systems. Management (defined here to include finance, accounting, human resources, and support functions such as legal departments, IT, as well as R&D) has raised its efficiency through downsizing, rightsizing, outsourcing, and business process reengineering. The improving productivity of nonmarketing functions has increased the sensitivity of senior managers regarding marketing productivity. Also, major consulting firms such as Booz Allen & Hamilton and McKinsey have produced research studies that document declining marketing productivity (Mitchell 1994). 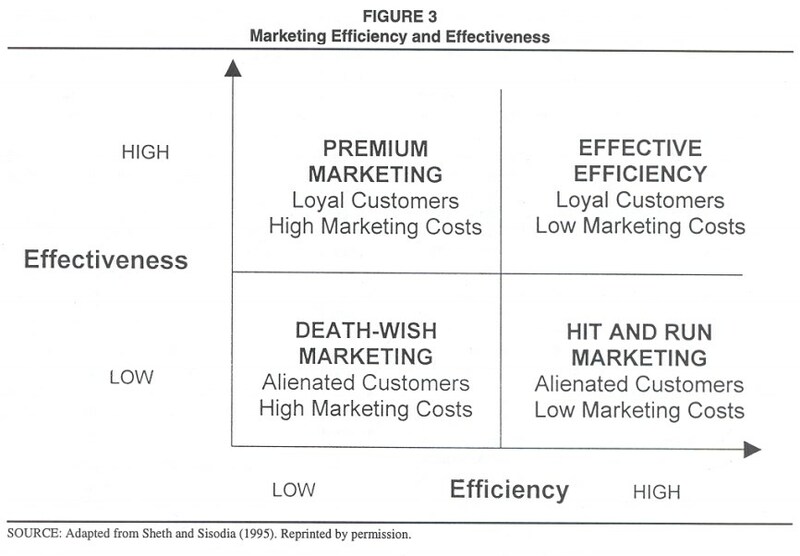 Marketing productivity as we define it includes both the dimensions of efficiency (doing things right) as well as effectiveness (doing the right things), as depicted in Figure 3 (Sheth and Sisodia 1995). Ideally, the marketing function should generate loyal and committed customers at low cost. Often, however, companies either create loyal customers at unacceptably high cost, as is the case with many loyalty and direct sales programs, or they alienate customers in their search for marketing efficiencies (e.g., telemarketing with $40 to $60 billion a year in estimated consumer fraud). In too many instances, they achieve neither loyalty nor low costs, as with most consumer couponing. As stated earlier, marketing needs to pursue the ideal of effective efficiency in all of its programs and processes. Mass marketing was both effective and efficient compared with local marketing but became less so with evolving customer heterogeneity and better approaches for targeting. Similar pressures are expected to enhance the practice of customer-centric marketing. Proposition 1: In an industry with low marketing productivity, there will be a greater impetus to practice customer-centric marketing when compared with an industry with high marketing productivity. Market diversity is increasing in both business and consumer markets (Sheth, Mittal, and Newman 1999; Sheth and Sisodia 1999b). This diversity is generating market fragmentation and consequently mass market and segment marketing will become less effective and efficient. In business markets, diversity is increasing due to size, locations, and type of business. Regarding size, small businesses dominate, and in 1996, there were 5.48 million businesses in the United States, of which only 91,000 had more than 100 employees and 15,600 had more than 500 employees (U.S. Bureau of the Census 1997). In the last decade, business markets have been pulled in two opposite directions. On one hand, there has been a growth in very large businesses, in part through megamergers (e.g., Time Warner, Bank of America, Daimler-Chrysler). On the other hand, small businesses with less than six employees have grown rapidly and are responsible for the majority of employment growth in the nineties. 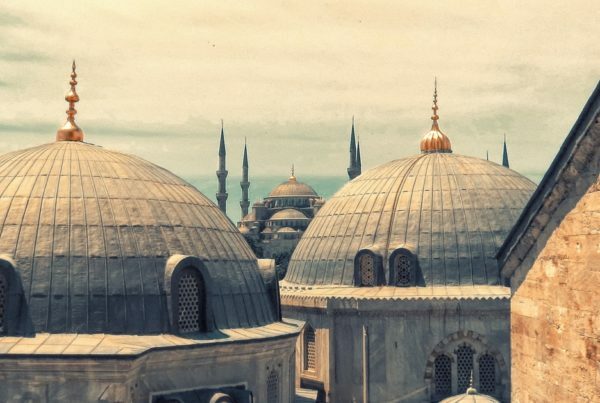 Locational diversity is another important issue in business markets. There has been a growth in the global business of large firms and at the same time a growth in home businesses. While small businesses with less than 50 employees predominantly operate from a single location, large businesses with more than 500 employees operate out of an average of 54 locations each (U.S. Bureau of the Census 1992). The third facet of diversity concerns the type of business. In the last decade, there has been a disproportionately large increase in nonmanufacturing firms. While manufacturing firms increased by 60,000 between 1992 and 1997, service firms increased by 272,596 (U.S. Bureau of the Census 1997). Similarly, service industries created 6.8 million new jobs when compared to manufacturing, which created 1.5 million jobs. These differences in size, location, and type of companies have led to a high level of diversity in the needs, wants, and resources (capital, human resources) of business customers. Business marketers to some extent are already addressing this diversity. For example, on the basis of the buying behavior of business customers, a large firm may use electronic commerce, direct mail, inbound telemarketing, outbound telemarketing, product specialist sales force, national account management teams, and global account management teams. In fact, most businesses develop special programs (including products, services, and marketing activities) for their large business customers (Sharma 1997). The post–World War II consumer was typically part of a middle-class family with one wage earner and a homemaker with two or three children. A high percentage of purchases were made by households in the 18-to-34-year old age-group. Since then, demographic patterns have shifted dramatically, leading to market diversity in terms of the needs and wants as well as resources (financial, expertise, and time). Four major demographic variables are increasing the variance in consumers’ needs, wants, and resources: lifestyle diversity, ethnic diversity, income diversity, and age diversity. Lifestyle diversity. The traditional family (breadwinner, homemaker, and children) is a small minority today. A reason is the increase in the proportion of working-women households. There has been a dramatic shift in the proportion of working women, and full-time working women will rise to 70 percent of all women above the age of 18 by 2000, making households more wealthy but time-poor. According to the Bureau of Labor Statistics, between 1996 and 1997, the number of dual-worker families rose by 352,000, while the number of traditional families—in which only the husband was employed—declined by 145,000. About 72 percent of all married mothers and 75 percent of unmarried mothers worked full-time in 1997. Even among mothers with children younger than 1 year old, 58 percent worked or were looking for work in 1997. 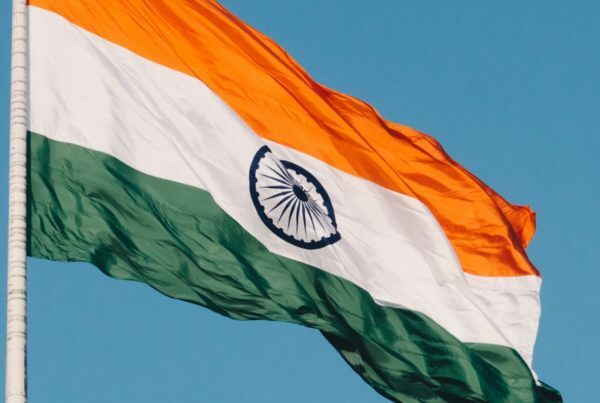 As a result of these developments, there will be a greater emphasis on time and place convenience, which will lead to time shifts and the outsourcing of home activities such as cooking, cleaning, and child care by busy households (Sheth and Sisodia 1999a). Ethnic diversity. The United States is rapidly moving toward ethnic pluralism, as some minority groups grow rapidly (Cory 1995). The proportion of African Americans in the population is rising very slowly; it was 11.7 percent in 1918 and is projected to rise to 12.8 percent in the year 2000. On the other hand, Hispanics were 9 percent of the population in 1990 and are projected to be 11.2 percent in the year 2000, rising to almost a quarter of the population by the year 2050 (Cory 1995). The Asian population has also been growing at a rate faster than the White majority. Already, 29 percent of the workforce is some kind of minority. One third of all children in the United States in 1995 were Asian, African American, or Hispanic (Francese 1995). This increase in minority populations will greatly raise the diversity in demand. Income diversity. American society is increasingly polarized in terms of income levels. Income diversity is rising with the decline of the middle class and the rise of the affluent and the “new poor.” The affluent class now represents more than 35 million households out of 110 million. Purchases of luxury goods and services are growing at about four times the rate of overall spending. The middle 60 percent of households contributed 52 percent of aggregate household income in 1973, a share that declined to 48 percent by 1995. During the same period, the share of income of the top 20 percent rose from 44 percent to 48 percent. Thus, the top 20 percent of U.S. households now earn the same as the middle 60 percent, while the bottom 20 percent earns only 4 percent of total household income (Francese 1995). As a result of such polarization, we have seen simultaneous growth at the extremes: more premium products (e.g., superluxury cars) as well as more economical ones (e.g., small basic cars). Age diversity. Today, there are five adult generations coexisting and coliving for the first time: prewar (before 1914 birth date), silent majority (1914-1946), baby boomers (1946-1964), generation X (1964-1980), and generation Y (born after 1980). This has created huge diversity in demand. For example, baby boomers are typically dual earners for whom time and convenience are very important. In contrast, the needs and wants of older-generation Americans focus toward health, wealth, safety-security, and recreation. Proposition 2: In an industry with high market diversity, there will be a greater impetus to practice customer-centric marketing when compared with an industry with low market diversity. Certain industries can apply technologies to their processes better than other industries. For example, technology is used extensively in financial institutions but infrequently at hair salons. The applicability of technology in industries enhances the development of customer-centric marketing. Four characteristics of technology applicability — affordability, versatility, capability, and scalability are particularly noteworthy for a firm or industry. Technological advances are allowing marketers to provide unique solutions for individual customers, that is, to practice customer-centric marketing. We discuss technology-related advances in the three major areas of production technology, distribution technology, and facilitation technology. Production technologies such as computer-aided design/computer-aided manufacturing (CAD-CAM) and databases are being used to create better and more customized products. Similarly, flexible manufacturing systems and just-in-time production allow marketers to mass customize products with better quality at lower cost. Distribution has been enhanced by the introduction of scanners, and electronic data interchange (EDI) combined with better forecasting technologies allows faster replenishment cycles with fewer stock-outs. In addition, firms such as FedEx and UPS have allowed marketers to rapidly deliver products at affordable prices. The Internet has become one of the major facilitation technologies that allows marketers to provide customized information and complete transactions at a fraction of the cost of other media. The Internet has certain characteristics that aid customer-centric marketing. First and foremost, it has the capability of addressing individual customers and also being responsive (Deighton 1997). Second, it has the ability to store vast amounts of information, be interactive, and also complete transactions (Peterson, Balasubramanian, and Bronnenberg 1997). Finally, the Internet allows customers to seek unique solutions to their specific needs. We can already see customer shopping habits change due to the Internet; as of mid-1999, approximately 40 percent of automobile buyers perused the Internet before they visited a dealer, up from 25 percent a year earlier. Proposition 3: In an industry with high technology applicability (affordability, versatility, capability, and scalability), there will be a greater impetus to practice customer-centric marketing when compared with an industry with low technology applicability. The growth of customer-centric marketing will change the vocabulary and metrics of marketing. As firms practice customer-centric marketing, they will begin to identify with individual customers and marketing terminology will increasingly be geared toward individual customers. In addition to this focus on individual customers, we expect other dramatic nonintuitive changes. Marketing management has traditionally been viewed as demand management (cf. Kotler 1973). The focus had been on the product, and the role of the marketing function was to stabilize demand through promotional sales, couponing, and price adjustments to meet the product sales goals of the organizations. Customer-centric marketing will increasingly make the marketing function responsible for supply management. The customer will be the starting point for marketing activities for multiple reasons. The increasing diversity in needs, wants, and resources of businesses and households will make customer behavior inherently less predictable and forecasting less accurate. In such an environment, companies that succeed will be those that can rapidly adjust their supply to meet demand, that is, practice demand-driven supply management (e.g., use efficient consumer response [ECR] for supply management). For example, airlines use yield management to optimally allocate available capacity across fare classes and manage demand to match capacity. Many airlines are now able to dynamically manage capacity by canceling or adding flights at short notice. Customers will drive the exchange process. Consequently, rather than trying to influence people in terms of what to buy, when to buy, how much to buy, marketing will be more concerned with better responding to customer demand. For example, the Cisco Systems web site enables customers to order hardware and software solutions unique to their existing and planned infrastructure. Proposition 4: A customer-centric firm is more likely to practice supply management when compared with firms that do not practice customer-centric marketing. Conversely, the marketing function in a firm that does not practice customer-centric marketing is more likely to practice “demand management” when compared with customer-centric firms. Most competitive strategy frameworks are based on aggregate market behaviors. With better information and accounting systems, firms are beginning to disaggregate revenues and costs to the customer or account level. This analysis often reveals previously hidden subsidies across customers, products, and markets. Moving to a customer-centric orientation enables a company to focus its resources on the most profitable customers. It also makes the company less vulnerable to focused competitors that may seek to “cherry pick” its most profitable customers. 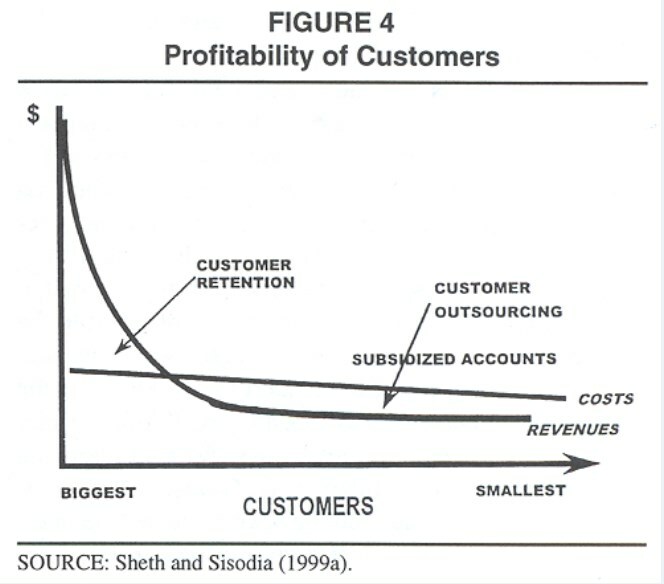 Sheth and Sisodia (1999b) depict a typical profit curve for customers of a firm (Figure 4). When marketers use a mass-market or even a segment-based approach, a small group of customers typically account for a large share of revenues and an even greater share of profits. These customers effectively subsidize a large number of marginal and, in many cases, unprofitable customers. The costs to serve unprofitable customers are comparable with, and sometimes higher than, the costs of serving the most profitable customers. Strategically, marketers have two choices regarding unprofitable customers. The first but inferior strategy is neglect, which leads to dissatisfied and alienated ex-customers and undesirable public relations consequences. The second and more appropriate strategy is the out-sourcing of customers (Sheth and Sisodia 1999b). Marketing has traditionally outsourced some of its functions to third parties (e.g., distribution and advertising), but not customers. The outsourcing of customers can take many forms. For example, a company may contract with an outside vendor to serve certain customers – a change the customers may not even be aware of. Alternatively, a company could sell its customer base to another company for a one-time fee or for a share of future revenues or profits. Fundamentally, the logic of customer outsourcing is to make unprofitable customers profitable by making them a part of another company’s more favorable cost structure. For example, a local telecommunications company that provides a bundle of services to customers is likely to make more profit on a low-volume long-distance customer than a company that only sells that customer long-distance service. The key is to identify competitor-partners for whom the outsourced customers could become part of a broader one-stop-shopping strategy. Proposition 5: A customer-centric firm is more likely to outsource customers when compared with firms that do not practice customer-centric marketing. Con-versely, a firm that does not practice customer-centric marketing is more likely to subsidize unprofitable customers when compared with customer- centric firms. With an increase in customer-centric marketing, customers will have an increasing role in the fulfillment process, leading to “cocreation marketing.” Cocreation marketing involves both the marketers and the customer who interact in aspects of the design, production, and consumption of the product or service. We see this process in services (e.g., hairstyling) but will increasingly see it for physical products. For example, in coming years, General Motors plans to allow customers to customize an automobile that will be manufactured to their specifications. The key aspect of cocreation marketing is customer-firm interaction, and the Internet is a key platform. The extent of cocreation marketing depends on how much customer knowledge a company is able to accumulate and use. Cocreation marketing enables and empowers customers to aid in product creation (e.g., Gateway computers), pricing (e.g., priceline.com), distribution and fulfillment (e.g., GAP store or GAP online delivered to the house), and communication (e-mail systems). Cocreation marketing can enhance customer loyalty and reduce the cost of doing business. The United States is moving toward a 24-7 (i.e., 24 hours a day, 7 days a week) economy in which customers refuse to be held hostage by time and place. In customer service, this has resulted in a variety of mechanisms to enable customers to serve themselves at their own convenience, through the use of intelligent automated support systems such as automated teller machines (ATMs). ATMs reduce the cost of transactions and enhance customer loyalty by providing the service customers require at the time that they require. With cocreation marketing, the concepts of collaboration, cooperation, and communication become very important. Proposition 6: A customer-centric firm is more likely to practice cocreation marketing when compared with firms that do not practice customer-centric marketing. Conversely, a firm that does not practice customer-centric marketing is more likely to have fewer interactions between the customer and firm, when compared with customer-centric firms. Marketing has been a part of general sales and administration (GS&A) costs in income statements and has long been treated as an expense rather than an investment. By investing in marketing infrastructure (which can be leveraged across products and customers and over time), we believe marketing can deliver better performance at lower cost. Fundamentally, fixed-cost marketing is about reducing transaction costs. Marketers can reduce variable or transactional costs through investment in technology. Firms have invested heavily in technology to reduce the costs of customer service in banking, telecommunication, and airline industries. For example, a teller transaction costs a bank $3.50, whereas an ATM transaction costs only $1.25, and an Internet transaction costs a fraction of a penny. In the agriculture age, most costs were variable – seed, water, fertilizer, labor, storage, and transportation. The only fixed asset was land, which was usually inherited. In the industrial age, the total cost of doing business included sizable fixed and variable components. This gave rise to the economics of scale and scope; firms sought to spread their fixed costs over a larger volume. Average costs declined slowly with volume, and prevailing market prices tended to closely track production costs. The customer-centric marketing era will be the era of extensive customer transactions. The cost of conducting transactions will increase initially. In response, firms will invest in technologies to reduce transactional costs. As examples, databases and voice-response technologies have high fixed costs but reduce transactional costs. The costs of that infrastructure are largely invariant with respect to volume. Elements of the infrastructure can thus be profitably shared with other companies engaged in similar businesses or others targeting the same customers with complementary offerings. Fortunately, the biggest infrastructure element today, the Internet, already exists and requires a relatively small expenditure to use. By sharing the costs, companies can develop infrastructures of virtually unlimited capacity and extremely low unit costs. Adding additional complementary products and services that would be of interest to the same customer group can then leverage the marketing system. Proposition 7: A customer-centric firm is more likely to practice fixed-cost marketing when compared with firms that do not practice customer-centric marketing. Conversely, a firm that does not practice customer-centric marketing is more likely to have high variable costs when compared with customer-centric firms. The integration of marketing’s subfunctions has largely been limited to the practice of integrated marketing communications (IMC) in some firms (cf. McArthur and Griffin 1997). The adoption of customer-centric marketing presents an ideal opportunity for marketing to integrate activities around the customer. Customer-centric organizations will have different methodologies, vocabulary, metrics, and evaluation criteria. Marketing metrics will be oriented toward share of customer, customer processes, customer equity, and customer relationship management rather than concepts such as market share (Deighton 1997). In customer-centric organizations, the emphasis will be on the full integration of all customer-facing activities by better aligning all firm activities around customer value-adding activities. Customer-centric organizations will not only integrate sales, marketing, and customer service function but also nonmarketing functions. Through the use of technology, all elements can get highly integrated around individual customers. This shift is already taking place in business-to-business marketing, through the key accounts system that includes sales, marketing, customer service, financial, and production functions. Similarly, current sales force automation (SFA) systems allow sales to be tightly integrated with production. This integration will continue across geographical boundaries (to match customers), within the marketing function, as well as across different functions. Proposition 8:A firm that practices customer-centric marketing is more likely to integrate marketing and nonmarketing functions when compared with firms that do not practice customer-centric marketing. Conversely, a firm that does not practice customer-centric marketing is more likely to have functional silos when compared with firms that practice customer-centric marketing. We believe that a broad evolution toward customer-centric marketing is inevitable. However, there are several external or exogenous factors that may enhance or restrict the growth of customer-centric marketing in particular situations. These factors – public policy, corporate culture, industry structure, and scope economies – are discussed next. Public policy, especially in the United States, has been instrumental in the extremely rapid recent growth of the Internet. The U.S. government reduced the cost of accessing the Internet and has given sales on the Internet a tax exemption. The future growth of many key technologies will depend partly on such public policy encouragement. The corporate culture of a firm will greatly affect the adoption of customer-centric marketing (cf. Christensen 1997). Firm-level factors such as dominant attributes, leader style, and strategic emphasis will affect the adoption of customer-centric thinking (cf. Deshpandé, Farley, and Webster 1993). The first area is a dominant attribute that may arise from the genetic foundation of the firm. Firms that are engineering driven would need more impetus for converting to a customer-centric organization relative to firms that were organized for a specific customer segment (e.g., Courtyard by Marriott for the business traveler). Firms that are market driven rather than technology driven are more likely to engage in customer outsourcing and cocreation marketing and adopt a customer-centric organization, while we expect no such relationship with the adoption of supply management or fixed-cost marketing. The second is the leadership style. The success of firms in the customer-centric era will be based more on the ability of leaders to implement change more than any other factor (Charan and Colvin 1999). The final factor is a strategic focus. Treacy and Wiersema (1997) have suggested that firms have operational excellence, technology excellence, or a customer intimacy focus. Firms with a customer intimacy strategic focus are more likely to practice customer-centric marketing. Some industries will be more prone to customer-centric marketing. In industries that are mature and concentrated (characterized by the presence of a few large firms and many small firms), we would expect to see greater outsourcing of customers, more sophisticated supply chain management, and more fixed-cost marketing systems. Also, industries in which firms have legacy systems in business marketing processes, systems and infrastructure will be more reluctant to abandon existing assets. This recognition has led researchers to comment on the increasing stranded marketing assets of firms (Sheth and Sisodia 1997). Industries that have high diversity in demand (e.g., food) and low cost of adaptation (e.g., personal computers) will be at the forefront of customer-centric marketing. Conversely, industries in which the cost of customer adaptation in production is high (e.g., basic metals) and the majority of customer requirements are not variable (e.g., rolled steel) will not see the rapid expansion of customer-centric marketing. In confirmation of the importance of industry structures, three sectors have been in the forefront of customer-centric marketing – business marketing, direct marketing, and services marketing. Business firms are in the forefront of practicing customer-centric marketing because they have a small set of customers that are easy to monitor and are also individually important to the marketing firm. Direct marketing was based on contacting and serving individual customers, that is, customer-centric marketing. Service firms have also been at the forefront of customer-centric marketing due to their greater ability to customize their offerings. To organize for customer-centric marketing, firms will need to define themselves as “customer specialists.” In addition, firms will need to enhance the scope of their offerings, which will enable them to share their costs over a larger assortment of products. By doing so, companies begin to look more like “one-stop shops” for a range of loosely related products and services, some of which they produce and most of which they acquire from other producers. This requires the development of core competencies surrounding particular customers and customer groups. Excellent examples are Wal-Mart, which provides discount merchandise, groceries, and banking service to its customers, and AT&T, which provides local, long-distance, wireless, cable, and Internet services to its customers. If an industry exhibits a high level of scope economies (firms able to effectively and profitably engage in a variety of related businesses), we would strongly expect to see the emergence of customer-centric marketing. We would expect to find greater investment in fixed marketing infrastructure, especially in customer-side assets. Such companies are likely to develop strong master (or umbrella) brands that they use across a diverse range of products. We would expect to find highly sophisticated supply management practices, since such firms are likely to acquire many of the products they provide customers from third parties. On the basis of the confluence of marketing productivity concerns, market diversity, and new technologies, we suggested in this article that marketing will gradually move toward customer-centric marketing. The antecedents, consequences, as well as moderators of the growth of customer-centric marketing were explicated. Marketing problems can be traced to overmarketing to certain segments (e.g., advertising, coupons, constant sales, too much reliance on internal sales forces, overbuilt distribution systems), and undermarketing or mismarketing to other segments. With an increase in ability to determine the profitability of specific customers, marketers can better respond to the needs of their more profitable customers. There is an unfounded belief that being customer oriented means having to spend more on marketing. We believe that the mechanisms we have described should improve both customer loyalty as well as marketing efficiency. Companies that thrive in the future will have an intimate understanding of their customers. The practice of customer-centric marketing will be central to the achievement of effective efficiency in marketing processes. Ashley, William C. and James L Morrison. 1997. “Anticipatory Management: Tools for Better Decision Making.” The Futurist 31 (5): 47. Bloom, Paul N., George R. Milne, and Robert Adler. 1994. “Avoiding Misuse of New Information Technologies: Legal and Societal Considerations.” Journal of Marketing 58 (January): 98-110. Borch, Fred J. 1957. “The Marketing Philosophy as a Way of Business Life.” The Marketing Concept: Its Meaning to Management. New York: American Management Association. Carson, David. 1967. International Marketing: A Comparative Systems Approach. New York: John Wiley. Charan, Ram and Geoffrey Colvin. 1999. “Why CEOs Fail.” Fortune, June 21, pp. 68-80. Christensen, Clayton M. 1997. The Innovators Dilemma. Boston: Harvard Business Press. Cory, Jim. 1995. “The New Consumer.” Chilton’s Hardware Age 232 (November): 44. Deighton, John. 1997. “Commentary on Exploring the Implications of the Internet for Consumer Marketing.” Journal of the Academy of Marketing Science 25 (4): 347-351. Deshpandé, Rohit, John U. Farley, and Frederick E. Webster Jr. 1993. “Corporate Culture, Customer Orientation, and Innovativeness in Japanese Firms: A Quadrad Analysis.” Journal of Marketing 57 (January): 23-38. Francese, Peter. 1995. “America at Mid-Decade.”American Demographics 17 (February): 23. Gilmore, James H. and B. Joseph Pine II. 1997. “The Four Faces of Mass Customization.” Harvard Business Review 75 (January-February): 91-101. Kohli, Ajay K. and Bernard J. Jaworski. 1990. “Market Orientation: The Construct, Research Propositions, and Managerial Implications.” Journal of Marketing 54 (April): 1-13. Kotler, Philip. 1967. Marketing Management: Analysis, Planning, and Control. Englewood Cliffs, NJ: Prentice Hall. ———. 1973. “The Major Tasks of Marketing Management.” Journal of Marketing 37 (October): 42-49. Mallen, Bruce. 1975. “Marketing Channels and Economic Development: A Literature Overview.” International Journal of Physical Distribution Management 5 (5): 232-237. McArthur, David B. and Tom Griffin. 1997. “A Marketing Management View of Integrated Marketing Communications.” Journal of Advertising Research 37 (September): 19-28. McKitterick, John B. 1957. “What Is the Marketing Management Concept.” In The Frontiers of Marketing Thought. Chicago: American Marketing Association, 71-82. McRae, Hamish. 1996. “Seismic Forces of Global Change.” Strategy & Leadership 24 (November 21): 6. Mitchell, Alan. 1994. “Dark Night of Marketing or a New Dawn? Changes in the Marketing Function.” Marketing February 17: 22. Narver, John C. and Stanly F. Slater. 1990. “The Effect of Market Orientation on Business Profitability.” Journal of Marketing 54 (October): 20-33. Peppers, Don and Martha Rogers. 1993. The One to One Future: Building Relationships One Customer at a Time. New York: Doubleday. ———, ———, and Bob Dorf. 1999. “Manager’s Tool Kit: Is Your Company Ready for One-to-One Marketing?” Harvard Business Re- view 77 (January-February): 151-161. Peterson, Robert A., Sridhar Balasubramanian, and Bart J. Bronnenberg. 1997. “Exploring the Implications of the Internet for Consumer Marketing.”Journal of the Academy of Marketing Science25 (4): 329-346. Pine, Joseph B., II, Bart Victor, and Andrew C. Boynton. 1993. “Making Mass Customization Work.”Harvard Business Review71(September-October): 91-103. Sharma, Arun. 1997. “Who Prefers Key Account Management Programs? An Investigation of Business Buying Behavior and Buying Firm Characteristics.” Journal of Personal Selling and Sales Management 17 (Fall): 27-39. Sheth, Jagdish N., Banwari Mittal, and Bruce Newman. 1999. Customer Behavior: Consumer Behavior and Beyond. New York: Dryden. ——— and Rajendra S. Sisodia. 1995. “Feeling the Heat: Making Marketing More Productive.” Marketing Management 4 (2): 8-23. ——— and ———. 1997. “Consumer Behavior in the Future.” In Electronic Marketing and the Consumer. Ed. Robert A. Peterson. Thousand Oaks, CA: Sage, 17-37. ——— and ———. 1999a. “Outsourcing Comes Home.” Wall Street Journal, June 28, p. 16. ——— and ———. 1999b. “Revisiting Marketing’s Lawlike Generalizations.”Journal of the Academy of Marketing Science27 (1): 71-87. Sloan,Alfred P. 1963. MyYearsWithGeneralMotors. NewYork: Doubleday. Smith, Wendell R. 1956. “Product Differentiation and Market Segmentation as Alternative Marketing Strategies.” Journal of Marketing 21 (July): 3-8. Treacy, Michael and Frederik D. Wiersema. 1997. The Discipline of Market Leaders: Choose Your Customers, Narrow Your Focus, Dominate Your Market. New York: Perseus. U.S. Bureau of the Census. 1992. Retrieved August 1999 from the World Wide Web. Available at www.census.gov. ———. 1997. Retrieved August 1999 from the World Wide Web. Available at www.census.gov. Webster, Frederick E., Jr. 1980. Top Management Views of the Marketing Function. Cambridge, MA: Marketing Science Institute. Jagdish N. Sheth is the Kellstadt Professor of Marketing in the Gouizeta Business School at Emory University. He has published 26 books and more than 200 articles in marketing and other business disciplines. His book, The Theory of Buyer Behavior (with John A. Howard), is a classic in the field of consumer behavior and is one of the most cited works in marketing. His other books include Marketing Theory: Evolution and Evaluation (with David Gardner and Dennis Garrett) and Consumption Values and Market Choices: Theory and Applications (with Bruce Newman and Barbara Gross). the telecommunications industry, as well as a number of telecommunications industry and company analyses. 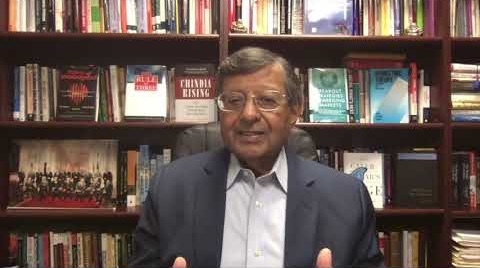 Arun Sharma is an associate professor of marketing at the University of Miami. He has published more than 30 articles in marketing and his interests are in the area of market and marketing evolution.